Locally owned shops were once cornerstones for products, services, employment and social networks in urban neighborhoods. The rise of automobiles, franchises and Internet shopping has forced many out of business or into niches that don't correspond with the needs of their local communities. However, in some cities they're seeing a resurgence due to creative initiatives that link grassroots activism with public- and private-sector resources. 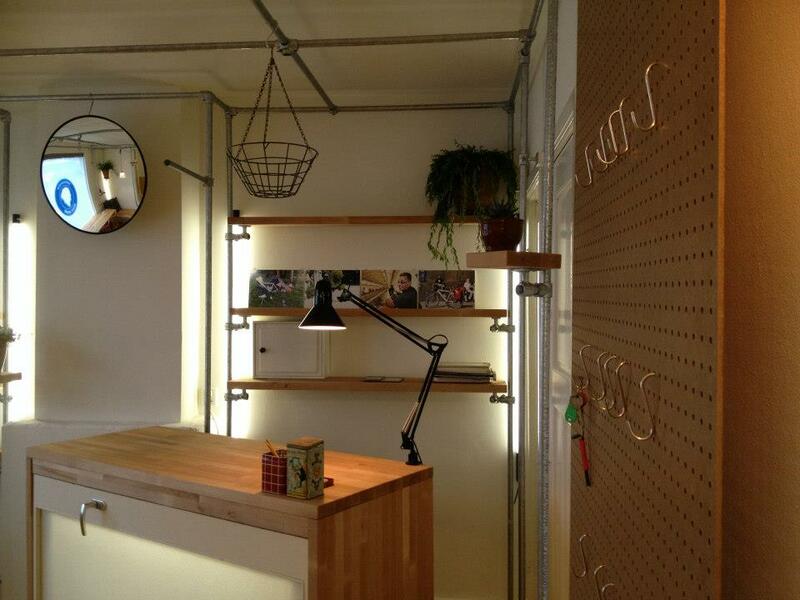 In February, a special kind of shop opened in Amsterdam's Van der Pek neighborhood. 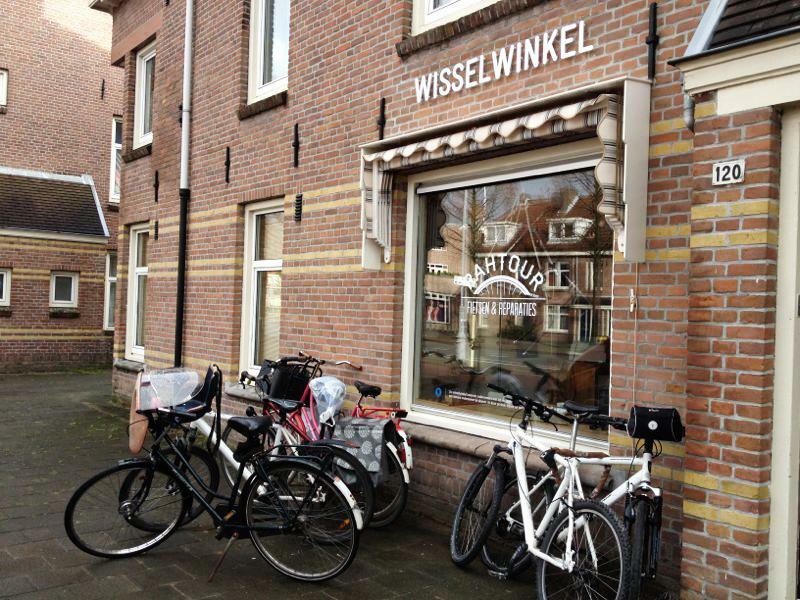 It is called the Wisselwinkel, meaning "shift shop," because it hosts a new local entrepreneur every six months. If this trial period goes well, the entrepreneur receives assistance in setting up a more permanent location in the neighborhood. The Wisselwinkel is the brainchild of a young activist collective named Mama Louise. Their identity is a tribute to Louise Went, an influential advocate for public health and social justice in Amsterdam's working-class neighborhoods during the 1920s. Mama Louise organizes D.I.Y. summer markets and other events where people make things, give performances and exchange goods and services. The events strengthen community ties and offer opportunities for entrepreneurial residents to earn income. Mama Louise is now working to create a more permanent platform, and the Wisselwinkel is the first tangible result. The Van der Pek neighborhood is absorbed in a process of gentrification and large-scale restructuring that threatens to displace many current residents. To help counter displacement, Mama Louise invests in people. Their aim is to uncover the neighborhood's hidden entrepreneurs, connecting local skills with local needs. There are several conditions for entrepreneurs who wish to set up shop in the Wisselwinkel. They have to live in the neighborhood and show a desire to start or formalize a business. Once running, the shop has to be open at least five days a week and adopt high-quality marketing collateral developed with help from Mama Louise. Designed and constructed by MOS Collectief, the Wisselwinkel interior is flexible so that different startups can use it according to their needs. Along with the storefront, entrepreneurs receive practical guidance in connecting with support organizations, fulfilling legal requirements and attracting customers. 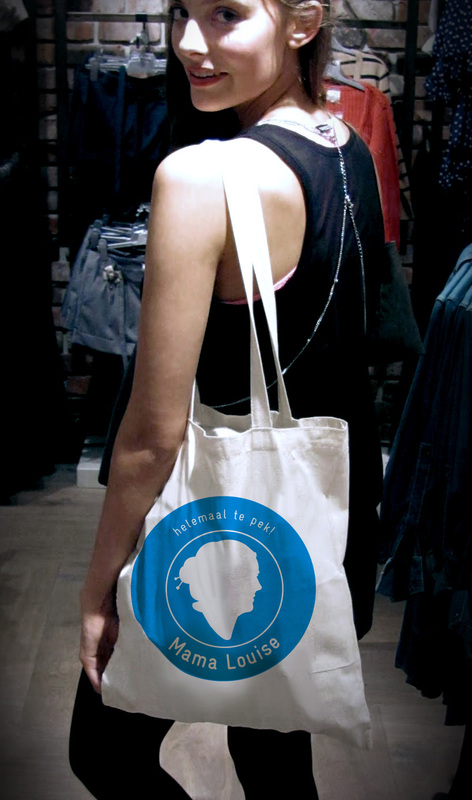 Mama Louise also provides a website, a logo, canvas bags and other material with help from Waarmakers design. After six months, the entrepreneur moves out of the Wisselwinkel to make room for the next venture. Local housing association Ymere helps viable startups find another location in the neighborhood. 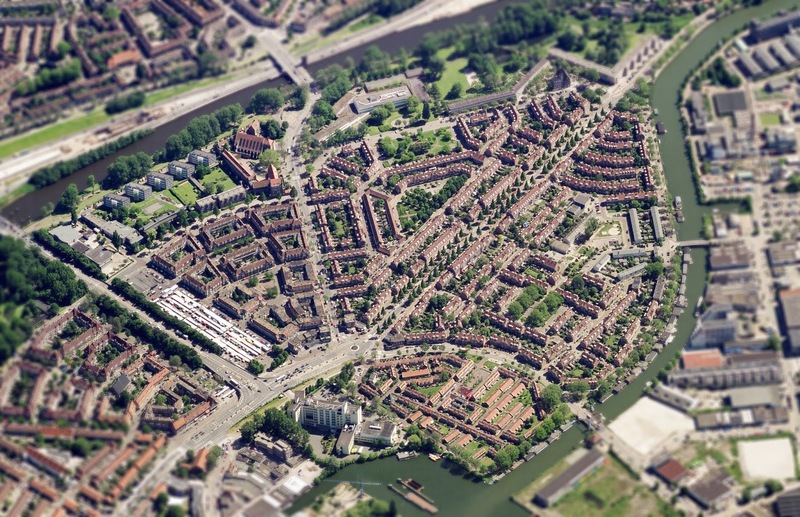 Associations like Ymere — which are no longer public entities in the Netherlands — are often criticized as focused primarily on maximizing real estate profits. However, Mama Louise found that Ymere staff took to their initiative with entusiasm rooted in genuine care for resident wellbeing. In working with Ymere, Mama Louise might be criticized for putting low-income entrepreneurs at risk of taking on insurmountable debt after the trial period. However, they help the Wisselwinkel's tenants become self-sustaining and attract investment. They channel the resources of organizations with a stake in Van der Pek's future toward opportunities for current residents to successfully weather gentrification. 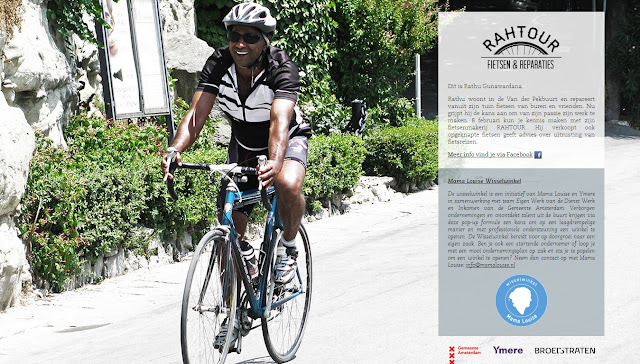 Screenshot of the Wisselwinkel website customized for Rathu's bike shop. The first entrepreneur in the Wisselwinkel is Rathu Gunawardana, who started out repairing bicycles for friends and neighbors in his backyard. Mama Louise supported his proposal because there was no bike-repair shop in the neighborhood and residents have expressed strong interest in having one. Through the city's Department of Work and Income, Rathu received a micro-loan for welfare recipients interested in starting their own businesses. Business has boomed for Rathu, who also sells restored bikes and gear. After a few days, his shop became a popular gathering place for local cycling enthusiasts. A teenage boy asked to help and now takes care of smaller repairs. Other informal entrepreneurs have started visiting the Wisselwinkel to apply for six-month residencies and offer their goods and services. Mama Louise is now building a map of formal and informal businesses in the neighborhood. Upcoming projects include a salon run cooperatively by local hair dressers, masseurs and other service providers. Each initiative is focused on developing commerce, employment, amenities and social ties to assure that current residents share in the benefits of gentrification. Mark Minkjan is an urban geographer who works as an independent researcher and writer. He is part of CITIES and Failed Architecture, and runs City Breaths. Credits: Photos by Mark Minkjan unless otherwise noted in the captions. Seems like a remarkable project. Thank you for sharing it. I wonder how Mama Louise supports itself and pays rent on the Wisselwinkel space. Is it crowdfunded or is there a public or private sponsor? Great to see designers using their skills for the good of their community. And not easy, I would think, to find time to do high quality work for clients that are unable to pay the same rates as multinational corporations. Is Waarmakers doing this pro bono? I love seeing the grassroots and supportive communities emerging all over the world. Along with caring of people, caring of Earth and sharing, this is truly an inspiring story! Thank you for sharing! Mama Louise started as a collective that wanted do something (more than organising the one-day events they already did) in this neighbourhood, and they felt that supporting local entrepreneurship was a good way. They worked on a plan and proposed it to Ymere, the housing corporation. They support the project now, and also provide the space. Waarmakers started it as a pro bono thing, since they are friends of the Mama Louise people. When Ymere stepped in, they got paid for some of their work. 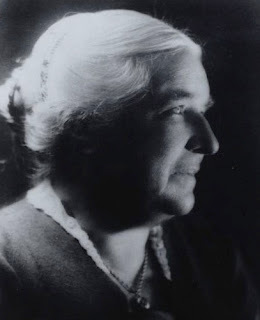 Mama Louise is also supported by an endowment foundation (Oranjefonds). So yes, there is funding, but the aim is to set up more self-sufficient projects, such as the collectively run salon.